This Skate Canada National ﻿﻿Program is a learn-to-skate program that teaches children the fundamentals of forward and backward skating, stopping, balance, turning, forward and backward cross-cuts etc. Beginner hockey and ringette players can also enhance their game by improving their skating skills with our program. We welcome children as young as 3 so long as they can participate in a 50 minute session, independent from their parents. 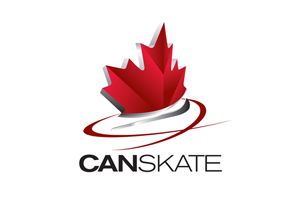 A new CanSkate program has been developed based on Sport Canada's long term athlete development (LTAD) principles. Exciting new features include a fresh new look, new awards, great tools for coaches and most importantly a tested and proven new curriculum and delivery methods that guarantee skater success in developing stronger basic skills and developing them faster. The new program also includes specific skills that pertain to hockey, ringette, speed skating and figure skating. The result is a dynamic new program that prepares all skaters for virtually every ice sport. The skaters will move more, use more of the ice surface and will have more fun. Following Skate Canada's guidelines where the skaters are in motion for 90% of the duration of the session, CanSkate features a FUN ZONE where skaters will perform skating skills while using circuits and props such as pucks, cones and pool noodles to enhance and improve their skating skills. What observers will notice most is a shorter warm-up time and more active lesson time. The skaters will spend part of each session with two different coaches: their lesson coach and their FUN ZONE coach. This brand-new style of CanSkate is going to be fast and furious! Skaters progress at their own speed as coaches test on a continual basis. Skate Canada certified coaches provide a "focus on fun" that creates the best quality learning environment possible. A maximum skater to coach ratio of 10:1 is maintained. The CanSkate program is organized into 6 progressive stages of learning. Each stage is broken down into 3 fundamentals – Balance, Control, Agility. There are 3 fundamental area ribbons for each stage, and six stage badges that can be awarded to the skater. Report cards are issued twice per season to track the skater’s progress. As the skater progresses through the stages in the CanSkate program they will become eligible to move into other Skate Canada programs offered by the Goulbourn Skating Club. Skate Canada is also proud to have all its programs taught by professional coaches who are specially trained and certified through the National Coaching Certification Program (NCCP). What age of child can participate in CanSkate? CanSkate is open for children ages 4 and up. Children who are aged 3 that parents feel can handle a 50 minute session without parent involvement are welcome to register as well. Participants need a pair of comfortable, well-fitting skates (hockey, recreational or figure skates are fine), and a CSA-certified Hockey Helmet. For first-time skaters, we recommend a winter jacket and snow pants or snow suit with mitts, ensuring that the skater is comfortable and has free mobility. As skaters progress beyond basic movement, lighter jackets and splash pants are more suitable. Our coaches are happy to answer any specific questions you may have. What is the Helmet Policy? Skate Canada has mandated that all skaters up to, and including Stage 5 must wear a CSA-certified multi-impact hockey helmet. Bicycle, ski or snowboard helmets are not allowed. There are no exceptions to this rule. For more information, you can read the Skate Canada's Helmet Policy FAQ. Upon completion of Stage 3 in the CanSkate program, skaters may choose to continue their development of skating in our Advanced Canskate program or development of power skating for Ringette and Hockey players through our CanPower program. Who do I ask for more info? Please see our FAQ page, or send us an email at goulbournscinfo@gmail.com and we will be happy to answer any other questions you have.